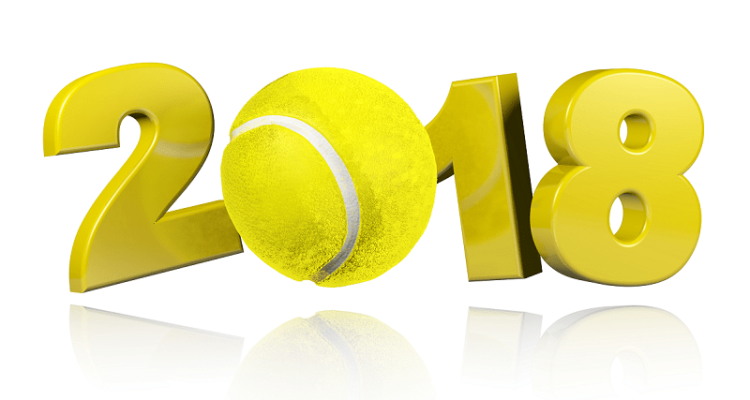 The 2018 tennis season in review. The 2018 professional tennis season will be remembered as one filled with mixed emotions, new and enduring stars, and great performances. Rafael Nadal won his 11th French Open singles title in June, but his season was bookended by a pair of midmatch retirements at the Australian Open and the U.S. Open. New stars emerged on the scene of both the ATP and WTA tours – Stefanos Tsitsipas, Karen Khachanov and Borna Coric come to mind on the men’s side, while Naomi Osaka, Daria Kasatkina and Aryna Sabalenka shone brightly for the women. There were enduring stars such as Roger Federer, who rose to No. 1 in the world rankings in February, becoming the oldest No. 1 in ATP rankings history, and Serena Williams, 37, returned from a year-long maternity leave and reached the finals at Wimbledon. Arguably the greatest performance – and biggest story – in tennis was the return to form of Novak Djokovic. The 31-year-old Serbian finished the year ranked No. 1 after dropping to No. 22 as recently as June. After a disappointing, injury-plagued beginning, Djokovic resurrected his season in the second half by capturing his 13th and 14th career Grand Slam titles at Wimbledon and the U.S. Open, and he won a pair of Masters 1000 crowns at Cincinnati and Shanghai. Djokovic also reached the final of the Nitto ATP Finals. The resurgence of Djokovic’s game and his rise to No. 1 was part of a throwback look at the top of the men’s rankings, which also saw Nadal and Federer share time at No 1. Although Nadal, 32, shut down his season early because of injury, and Federer, 37, skipped the entire European clay-court season, they finished ranked second and third behind Djokovic. What goes around comes around, and these three long-lasting figures of men’s tennis have maintained their excellence and consistency over the past decade. They were also the top three men in the ATP rankings back in 2007, and they finished in the same ranking order this year as recently as 2011. One need only look at the year-end Top 10 rankings and you’ll find that seven of them, including Kevin Anderson, 32, and John Isner, 33, are in their 30s. Add to that group a pair of 30-year-olds in Juan Martín del Potro and Marin Cilic and it’s a testimony to how stable they’ve been throughout much of their careers. How dominant have the 30-and-older crowd been? Consider this: There’s no active ATP player younger than 30 who has won a Grand Slam. This represents a first in the Open Era of tennis, which dates back to 1968. While there’s strength in numbers among the 30-and-up elders, youth is also being served, thanks to the emergence of several Next Gen stars – players who are 23 or younger – all who showed great potential. There’s six Next Gens in the Top 20 – Alexander Zverev, Khachanov, Coric, Kyle Edmund, Tsitsipas and Daniil Medvedev – and each one left their mark on 2018. Zverev broke into the Top 5 by winning back-to-back titles on clay in Munich and Madrid, and he added a hard court title in Washington, D.C. during the summer en route to beating Djokovic in the championship match of the year-end ATP Finals in London. Also, Khachanov won Marseille early in the season, then finished strong by winning in Moscow and at the Paris Masters, where he knocked off Zverev and Djokovic. Coric scored a pair of wins over Federer (in the final at Halle and at Shanghai) and was solid as a member of the winning Croatian Davis Cup team. Tsitsipas capped a break-out season by winning his first ATP title in Stockholm, then closed strongly as he lifted the winner’s trophy at the Next Gen ATP Finals in Milan. Edmund won his first ATP title in Antwerp and supplanted Andy Murray as British No. 1, and Medvedev simply won three titles, in Sydney, Winston-Salem and Tokyo. The men’s season culminated with Croatia winning its second Davis Cup title – and first in 13 years. Cilic and Coric scored all of the Croatian’s points in a 3-1 Finals victory over host France in the last home-and-away format final of the Davis Cup’s 118-year history. The cool but solid Cilic became a national hero with his 7-6 (3), 6-3, 6-3 win over Lucas Pouille that clinched the 2018 Davis Cup title. Next year, the Davis Cup will be overhauled into a World Cup-style 18-team, one week tournament to be played in November in Madrid, Spain. Meanwhile, on the women’s side, there were three first-time Grand Slam champions – Caroline Wozniacki won the Australian Open in January, Simona Halep captured Roland Garros in June, and Osaka showed brilliance and resolve in beating the 23-time Grand Slam champion Williams to win the U.S. Open in September. Elina Svitolina won the WTA Finals crown in Singapore, Ash Barty garnered the WTA Elite Trophy in Zhuhai, and the deeply-talented Czech Republic, which faced the U.S. without its two top players (Petra Kvitova and Karolina Pliskova were both injured), lifted the Fed Cup trophy with a 3-0 victory over the Americans. It was the Czech’s 11th Fed Cup title. Among the breakthrough stars on the WTA Tour this season were Kasatkina, Sabalenka and Osaka. Adroit on all surfaces, Kasatkina, 21, broke into the Top 10 by winning in Moscow and advanced to the quarterfinals of two Grand Slams, at the French Open and Wimbledon. She also reached the finals at Dubai and Indian Wells. The 20-year-old Sabalenka won her first WTA title at the Premier 5 event in Wuhan and earlier prevailed at New Haven on a hard court. She was also a finalist at Lugano on clay and at Eastbourne on grass. Finally, at just 21, Osaka reached the Top 5 thanks to winning a drama-filled final at U.S. Open. She strung together seven straight victories during the fortnight at Flush Meadows, which included wins over Sabalenka, Madison Keys in the semifinals, and a 6-2, 6-4 upset of Williams, who was chasing after her 24th career Grand Slam singles title. Finally, few athletes in any sport know the right time to call it a career. Yet, former Wimbledon finalist and World No. 2 Agnieszka Radwanska of Poland did. Just 29, she listened to her body. In announcing her retirement at the end of the season, Radwanska wrote, “This was not an easy decision. I am grateful to have so many special memories, including 20 WTA titles, the WTA Championships in Singapore, a Wimbledon final, and so many others. Radwanska, who brought much joy to the sport, leaves competitive tennis as one its great shot makers. Judging from the accolades of her fellow WTA Tour pros who showered her with praise via Twitter, she was one of the best liked, too. This entry was posted in ATP Tour, ATP Tour News, WTA Tour News and tagged 2018, Tennis.